The Mark IV is the most recent upgrade of the Merkava tank and is a 4th generation main battle tank that has been in development since 1999. The upgrade's development was announced in an October 1999 edition of the Bamachaneh ("At the Camp") military publication. 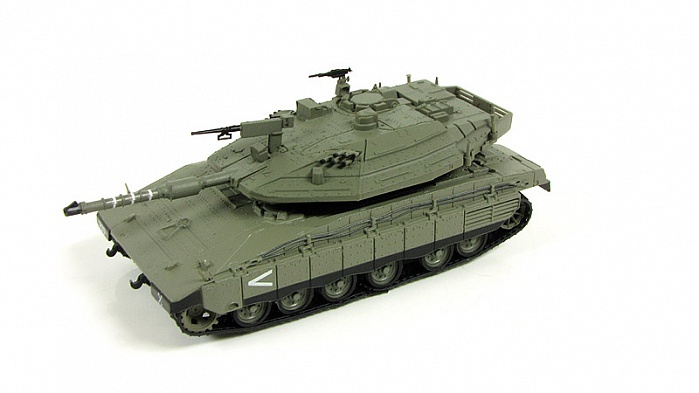 However, new Merkava Mark IIIs continued to be produced until 2003. 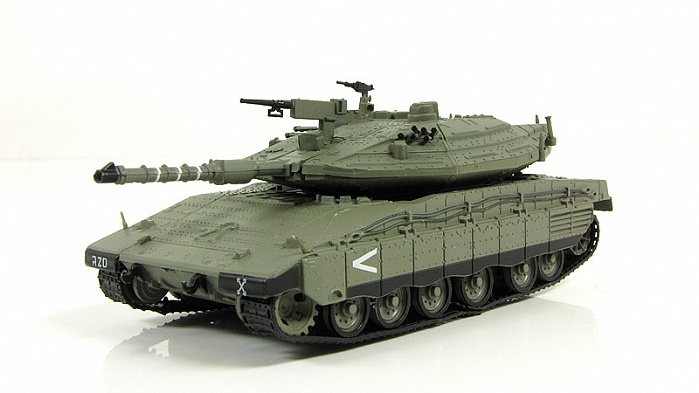 The first Merkava IVs were in production in limited numbers by the end of 2004. The model has a new fire-control system, the El-Op Knight Mark 4. 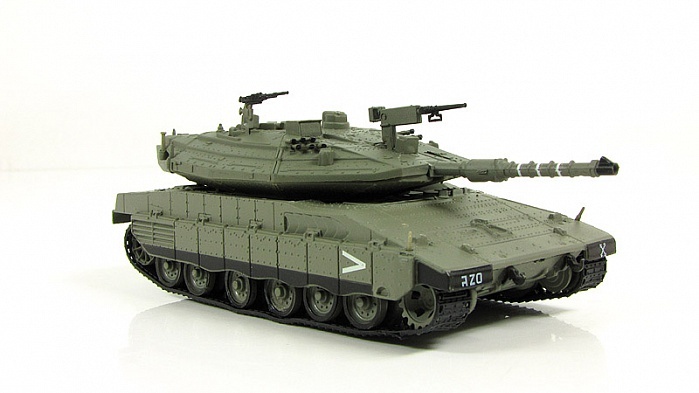 Removable modular armor, from the Merkava Mark IIID, is used on all sides, including the top and a V-shaped belly armor pack for the underside. This modular system is designed to allow for damaged tanks to be rapidly repaired and returned to the field. Tank rounds are stored in individual fire-proof canisters, which reduce the chance of cookoffs in a fire inside the tank. The turret is "dry": no active rounds are stored in it. Some features, such as hull shaping, exterior non-reflective paints, and shielding for engine heat plumes mixing with air particles to confuse enemy thermal imagers, were carried over from the IAI Lavi program of the Israeli Air Force to make the tank harder to spot by heat sensors and radar. The Mark IV includes the larger 120 mm main gun of the previous versions, but can fire a wider variety of ammunition, including HEAT and sabot rounds like the APFSDS kinetic energy penetrator, using an electrical semi-automatic revolving magazine for 10 rounds. It also includes a much larger 12.7 mm machine gun for anti-vehicle operations (most commonly used against technicals). 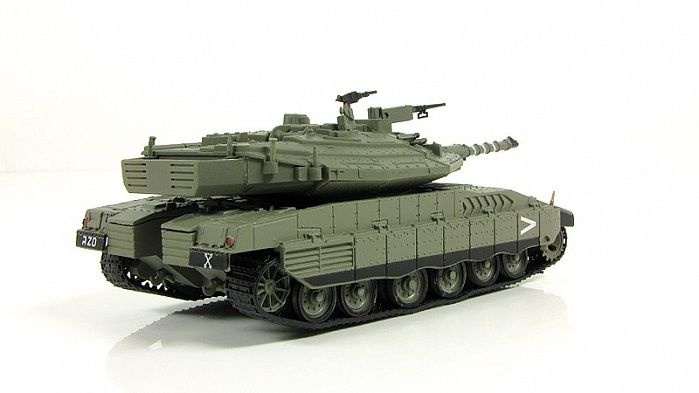 The new fire-control system enables the Merkava to shoot down helicopters such as the Russian Mil Mi-24 and the French Gazelle, both of which are used by Israel's neighbors. The Mark IV has the Israeli-designed "TSAWS (Tracks, Springs, and Wheels System)" caterpillar track system, called "Mazkom" (Hebrew: מערכת זחלים קפיצים ומרכובים, מזקו"ם‎) by troops. This system is designed to endure the harsh basalt rock conditions of Lebanon and the Golan Heights with minimal track-shedding. The tank carries the Israeli Elbit Systems BMS (Battle Management System; Hebrew: צי"ד), a centralised system that takes data from tracked units and UAVs in theater, displays it on color screens, and distributes it in encrypted form to all other units equipped with BMS in a given theater. 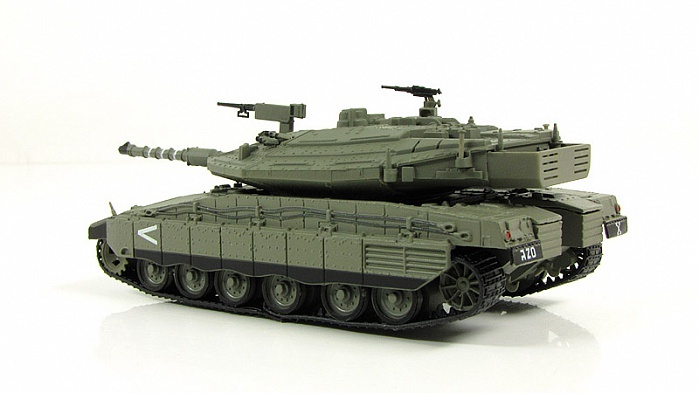 The Merkava IV has been designed for rapid repair and fast replacement of damaged armour, with the implementation of sections of modular armour that can be easily removed and replaced. 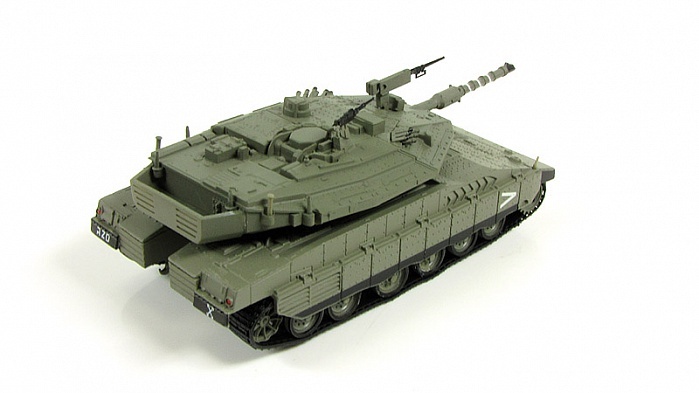 It is also designed to be cost-effective in production and maintenance; its unit cost is lower than for a number of other tanks used by Western armies.